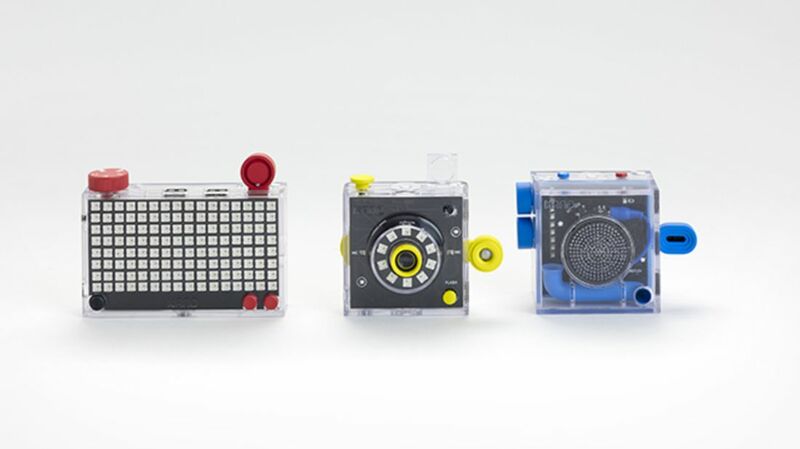 In 2013, Kano launched a Kickstarter to create a computer that someone with no technology experience—even a young kid—could build on their own. The resulting computer and screen kit let you build a computer and screen like you would a LEGO structure, with step-by-step instructions. Now, the company is adding more fun to the mix with a Kickstarter for three new hardware kits that let you build a speaker, a camera, or an LED pixel grid. Each kit allows you to program the hardware to respond to sound, motion, or other data inputs. The camera kit contains a camera roughly on par with the one found in an iPhone 5S, a built-in microphone, and fun additions like a tripwire sensor to track movements and a flashing LED ring. The pixel kit is a grid of lights that you can program to flash in different patterns and in response to different inputs, like noise picked up by the microphone, or motion picked up by the tilt sensor or joystick. If you connect it to a network, you can stream tweets or weather information from online. The speaker kit has a microphone, an LED audio visualizer, and a gesture sensor. Each kit comes with suggested projects like setting up your motion-sensing camera to take a picture every time someone opens the door to your room, turning your speaker into an alarm clock, or visualizing your music on the LED pixel grid. They’re simple enough that it’s relatively easy to see how you might put them to work on projects in the physical world, unlike the more complicated coding kits like littleBits, which, frankly, can give you so much freedom that if you’ve never done any programming or engineering, it's a little daunting to figure out where to start. The computer and screen kit, previously necessary to dig into any of Kano’s coding tutorials, costs a steep $284. While you can, technically, work with a screen or monitor you already have, the computer itself is still $150. The new kits present a slightly lower entry point into the company’s learning system, at just $99 each. Even better, the Kano World community and tutorials are accessible to anyone, and you don’t need a Kano computer to play around with the platform. You can do it from your desktop, and simply watch the changes on a digital version of the kit in question. Or you can make digital drawings and games, like you would on the Kano computer. Much like the Kano hardware kits are LEGO-like in their step-by-step process, letting you connect all the components yourself, all the coding tutorials feature enough guideposts that you don’t get frustrated, at least at first. The tutorial tells you exactly what to type, though you’re using real programming languages to do it. I've told myself I would learn to do some basic coding countless times, and I almost inevitably give up halfway through the first or second tutorial. But the simple way the Kano Code platform walks you through the steps makes me want to try more lessons, even though I don't have any of the kits myself. It's not going to turn me into a coding whiz—especially since it's hard to figure out what programming language you're even working in by just looking at the tutorials—but it's a frustration-free way to feel a little more comfortable manipulating the digital world.